This sweet little shed perfectly combines haven, hobby and workplace! 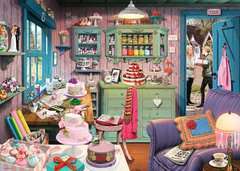 We imagine that the owner of this well-organized shed started decorating cakes as a hobby … but her pastime has now developed into a small business, with plenty of commissions ready for collection. Her wonderful creations will give you plenty of puzzling challenges as you piece together those sweet-filled jars, reels of ribbon and all that delicate icing.